Having celebrated another Week of Prayer for Christianity last month, what is there to fuel our hope that it wasn’t all just an exercise in futility? What’s to celebrate? Signals are there that this movement called “ecumenical” does in fact move, that an increasing degree of “life together” is shaping our perception of the future in positive ways. Their listing of what we share is substantive and long. The short version: We believe our life as churches to be centered on the Divine Liturgy, the Word of God, and the sacraments from baptism to marriage. Both churches recognize each other’s bishops as legitimately ordained into the apostolic succession. Both venerate Mary, the Mother of God, and a whole range of holy men and women from every age, many of them common to both our traditions. Both our churches cherish ancient practices that help the faithful grow in holiness, such as reverencing sacred images, fasting, the monastic life, and various forms of contemplative prayer. After 950 years of division between us, the language is now that “it is urgent” to put an end to this. One might say that, thanks to prayer, local action, and the work of commissions like this, there’s been a sea change. At the heart of our differences, they note, is the way each of our traditions understands the proper exercise of the primacy in the leadership of the Church, not only within Christianity as a whole but also within the various regions of the Christian world. 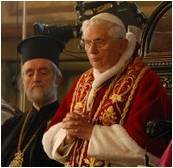 In the Christian East, “primacy” has a less supra-national character than it has acquired in the Latin Church. The underlying pattern among the Eastern churches was what is called “autocephaly”—ecclesiastical independence correlative to the emerging nation-state, with the head of the church in a given nation (the patriarch) seen as exercising primacy. The bishop of Rome would be seen as a member as well as head of the college of bishops, the senior patriarch among the primates of the churches. His fundamental worldwide ministry would be to promote the communion of all the local churches. 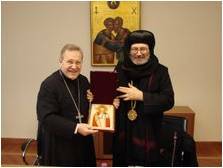 The fact that consultation members have reached the stage where they are concretely imagining it means that full communion between the Latin, Eastern Catholic and Eastern Orthodox Churches is closer than it has ever been before. That is ample reason for us to join our hearts and voices to those around the world in the January 18-25 Week of Prayer for Christian Unity and throughout the year.